Yearnings for spring and for “Play ball!” surfaced at the Sartell City Council meeting Feb. 25 when Jason Mathiasen updated the council about improvements to athletic fields in the city. Mathiasen, a member of the Pinecone Central Park Association, has been working nonstop with others to get the biggest bang for the buck in improving the city’s fields and athletic amenities so they can be ready for use this spring. Miller Architects was the main contractor. 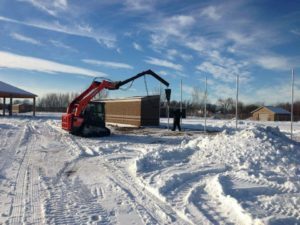 In 2017, the PCPA and the city of Sartell agreed to a partnership to make the improvements to fields in Pinecone Central Park and Champion Field (now known as St. Cloud Orthopedic Field). Almost all of those improvements have been completed after the work began last spring, Mathiasen said, except for the second youth baseball field in Pinecone Central. A major challenge in those fields was the soil condition, which was clay-like, thus very difficult to drain, making fields virtually unplayable at many times. Fifteen-thousand square yards of that soil was removed and replaced with good soil. The success of the improvements, Mathiasen said, can be credited to Sartell Public Works Director John Kothenbeutel and to engineer April Ryan of Short Elliott Hendrickson, the city’s engineering firm. Mathiasen met many times with them to fine-tune project plans to make everything as economically feasible as possible. All the projects cost about $100,000, money given by the city as well as raised by the PCPA. Many in-kind donations and money contributions lessened the project cost, including thousands of hours by volunteers to removed and replace sod. The removed sod was used in other areas of the city. Among the improvements, other than the major soil changes, are these: adding dugouts to the youth Field 1, doubling the size of its batting cage, backstop extended and made higher and safer, clay batting mound and home plate to prevent erosions and the need for constant resurfacing, a drainage tile system added to youth fields 1 and 2, and seeding and irrigation system added to Field 2. Champion Field was virtually “rebuilt,” Mathiasen noted – its playing surface, elevation changes, a state-of-the-art scoreboard, replacement of bull pens, irrigation system, added practice and warm-up areas and improvements to Champion’s nonplay and spectator areas, especially to facilitate drainage on the east end. The total cost was about $43,000, not counting the worth of so much volunteerism. Other improvements were sod replacement at Pinecone Park’s soccer fields, and a water feature to the dog park, which Mathiasen noted has become extremely well used since the park was created a few years ago. Mathiasen told the council the use of the fields has grown constantly, with six major tournaments in the summer and people coming to play from throughout the state. Lacrosse also is growing more popular. The only major unfinished project is youth baseball Field 2, Mathiasen noted. It will cost about $95,000, he estimated. The PCPA has applied for a $43,000 grant and will find out in April if the grant will be secured. Mathiasen requested the council to match the grant funds if and when the grant is received so the field could be readied for play possibly by mid-June. The matching money could come from the city’s Recreational Field Fund. The council voted unanimously in favor of Mathiasen’s request. The mayor and council member Tim Elness thanked Mathiasen. A soccer dad and a volunteer girls soccer coach, Elness said he has heard from so many out-of-town people, members of traveling soccer teams, about the excellence of Pinecone Central Park. Pinecone Central Park was created on the site of the former privately owned Sartell Golf Course after the city purchased that land about 10 years ago. Even in winter, some work can still be done at Pinecone Central Park in Sartell. Poles for athletic-field fencing are driven into the frozen ground.